Finally decided to try to cook risotto after months of watching my friend at work, S, bring in delicious looking risotto lunches. I’ve always been wary of the amount of stirring that i knew to be involved, but S convinced me that it being a one-pot dish, risotto should be relatively painless and can be very versatile (she puts beetroot in hers). 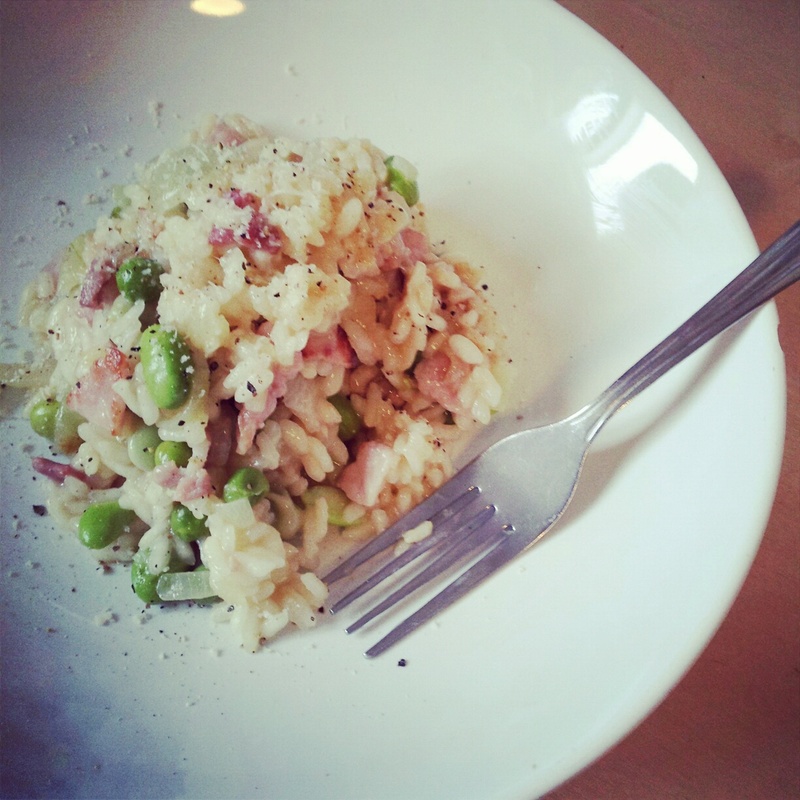 As this was a first attempt, I stuck to the basics: bacon, broad beans, peas, and a little yellow onion as the flavours of the risotto. It was extremely tasty, especially with a generous sprinkling of Parmesan on top, a bit of lime juice, and several grinds of black pepper. I think the lime juice is important because it cuts through the acidity, and with something like risotto where chances are it’s a lazy evening and you haven’t cooked anything else, you’ll want some sharper bursts of flavour as you munch your way through the one dish. Fresh lemon juice probably works too, but I think the sweetness of lime goes better with the bacon in particular. An apology though – I’ve decided though to not post a recipe because I honestly can’t remember the exact quantities used! I think I might start just posting loose recipes rather than hard and fast ones with exact measurements and timings, especially for dishes where I haven’t reproduced it enough to make me confident about the recipe. I’d love for my blog to be a documentary of my food experiences and for it to inspire others to turn to cooking for pleasure too, and I think it can do that without necessarily being an instruction manual. Having said that, one of my colleagues R was kind to say today that he made my lemon sole and pasta dish and said it turned out a very good way of cooking the dish! So, a big thank you to you all who read and post feedback — I really appreciate all of your positive thoughts as it is lovely to be part of a community of good-willed food lovers out there.